This came as more Zanu-PF officials were exposed for their riotous role during the three-day mass stayaway organised by the Zimbabwe Congress of Trade Unions and social movements to protest the sharp fuel price hikes announced by President Emmerson Mnangagwa last Saturday. "The court cannot just watch. These accused persons were severely assaulted and some have visible injury marks. The suspects cannot lose dignity or human rights because of the arrest. This can happen to anyone. The court needs to maintain the accused person's rights," Mandevere said. Eight other Zanu-PF youth leaders have appeared in court facing allegations of public violence and looting after they allegedly burnt a Zupco bus along the Harare-Bulawayo Highway before they looted a shop belonging to Chegutu East MP Webster Shamu (Zanu-PF). Zanu-PF Harare provincial youth league boss Godwin Gomwe was on Wednesday night also reportedly assaulted by soldiers for leading a terror group that was attacking suspected MDC supporters in Budiriro as well as participating in looting under the guise of restoring peace. Yesterday, a subdued Gomwe had promised to discuss the issue with NewsDay later in the evening, as he claimed to be with "certain important people" discussing important matters. "Can I call you later. I have your mobile number. I am with important people here, talking something very important. I will call in 30 minutes time," Gomwe said in a hushed tone. But Zanu-PF insiders said the youth league boss was leading a gang of 70 youths that went on a rampage in Budiriro and other residential areas, assaulting known MDC supporters, accusing them of having participated in the protests before he unleashed his troops to loot some shops. "He was using a fleet of 20 unmarked vehicles and he terrorised people, but luck ran out when they were stopped by the military, who wanted to know what they were doing and who had sanctioned their actions. He ignored them and went away. But the soldiers followed him to his residence, where he was assaulted together with members of his gang. He was left at Harare Central Police Station," a senior Zanu-PF official said. "The suffering you are going through is shared by everyone. But let us not be violent. Don't barricade the roads, especially with big stones and logs, try something which is not violent. 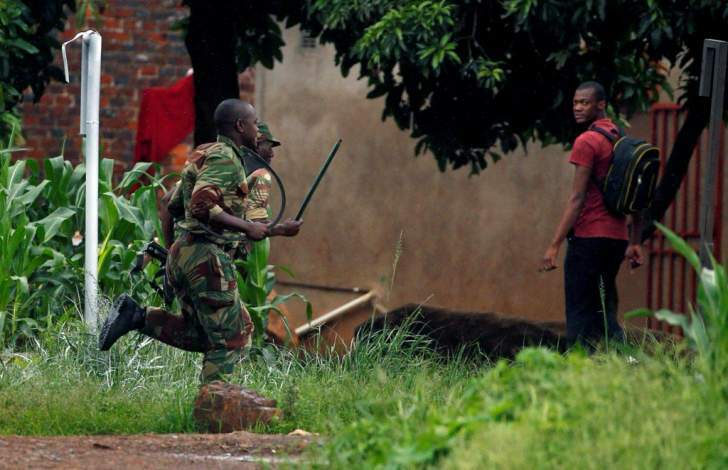 Do the stayaway in peace," a soldier at Dzivarasekwa 4 said. "Do whatever you want, we are supporting you, but don't be violent. We had to beat you because you were being violent. We don't want violence," the soldier told the residents. "They told us that they were not against the idea of the stayaway or protests, but barricading of roads and destruction of property. They actually said they sympathised with ordinary citizens," a resident told NewsDay.